Filtration is an important step in the wine making process. There are several techniques available, with each wine maker refining their own process to ensure the right blend of texture, taste, consistency and stability. The simple act of changing filtration technique has the potential to markedly influence these factors and hence the flavour, bouquet and full-bodied qualities of the wine. Rotary Vacuum Filters are a common filtration system used widely in wine-making. They enable continuous, automatic filtering of large amounts of liquid and can cater for feedstocks with high solids contents. Their popularity is a result of the high volumes that they can process and the wide variety of raw materials they can deal with. They consist of a large drum through which the wine is filtered. A vacuum applied inside the drum draws the liquid in and the drum filters out unwanted solids. The constant and consistent operation of the system is ensured by the knife edge blades. These blades scrape the solid waste materials off the (outside) filter face each rotation, effectively freshening it up for the next rotation. Filtered wine is then pumped out from the inside of the drum. Traditionally, Stellite, a cobalt-chrome alloy has been used for knife edge blades. Stellite blades have a limited lifespan and require regular replacement and hence downtime for maintenance. Stellite blades are expensive due to raw materials costs and the fact that they are all imported as there are no local producers in Australia. Stellite tipped blades are also available at lower cost, but they still suffer from the same wear problems as the full stellite blades. Stellite blades can be sharpened but this is also fairly expensive, with freight also needing to be taken into account. Stellite tipped blades can also be sharpened, but the number of time they can be sharpened is reduced compared to full stellite blades. In either case there is downtime and maintenance costs involved as well as lost production. Question: Did you ever wonder where all that worn metal went? Did you ever find metal filings? Alumina (or aluminium oxide) is an advanced ceramic material with superior hardness compared to stellite. The improved hardness of alumina over stellite translates into longer lifespans and reduced downtime and maintenance. Alumina is also more chemically stable than stellite. This means that metallic ions that may leach out of stellite and contaminate wines are no longer an issue. The raw materials are relatively inexpensive. 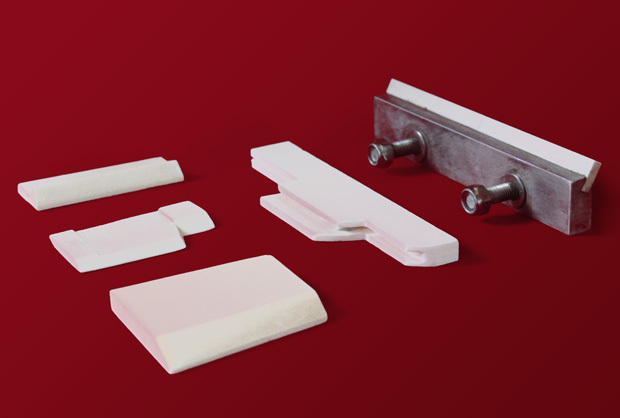 Taylor Ceramic Engineering also manufacture the blades in Australia minimising freight. TCE also have the expertise to manufacture blades that can be retrofitted to your existing system.